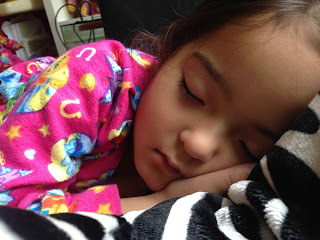 Wordless Wednesday- I'm Not Sleepy...!! Sewing Pattern Testing- Little Lizard King- Janie Lou, I LOVE you! 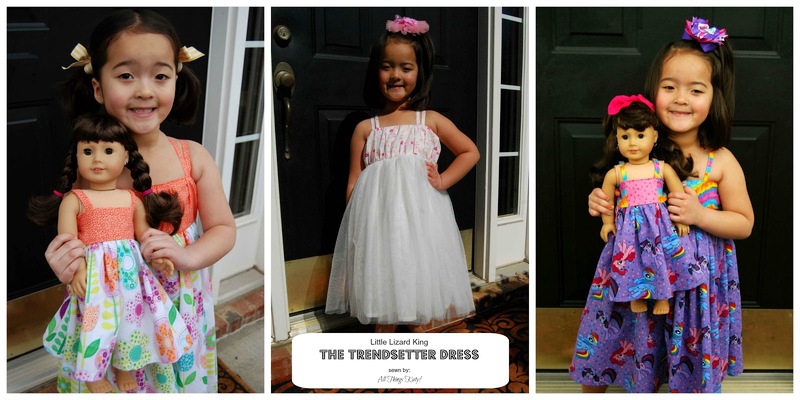 Cassie of Little Lizard King is at it again.... this time with the Janie Lou Dress!! This dress is described as an, ".... A-line skirted top or a full gathered dress with a chevron bodice inset (optional), side sashes (optional) and a tabbed button closure along with elbow length sleeves with cuffs." This dress is definitely a labor of love, but boy, oh, boy do I LOVE the sweet details! 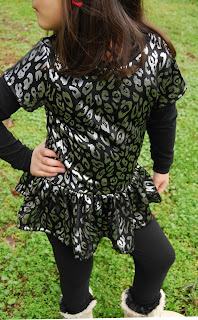 -The Little Lizard King Janie Lou Dress is sized for 12m-12y. -The Little Lizard King Janie Lou Dress features an optional pintuck bodice inset (along with a plain bodice inset). 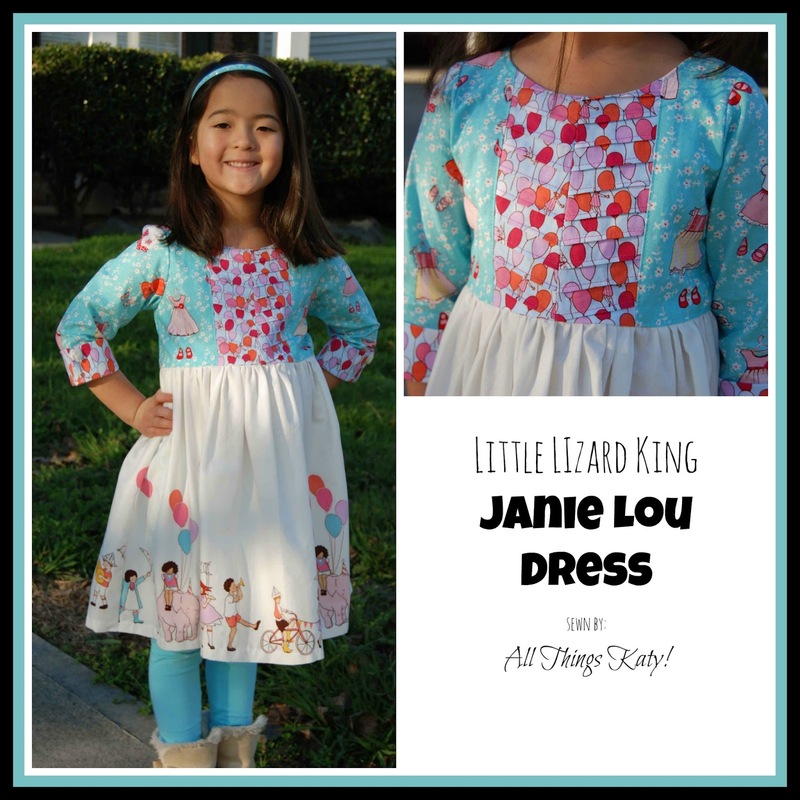 -The Little Lizard King Janie Lou Dress includes step-by-step instructions for the pintuck bodice inset. Be sure to pay close attention to both the words and the pictures- trust me, it will walk you through it! 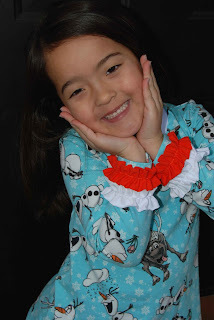 -The Little Lizard King Janie Lou Dress features a fun, decorative sleeve cuff. 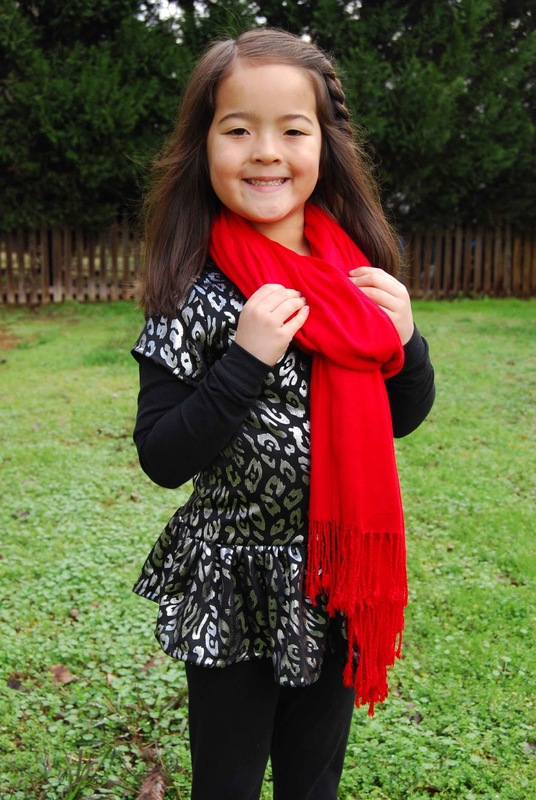 -The Little Lizard King Janie Lou Dress features a button back closure. 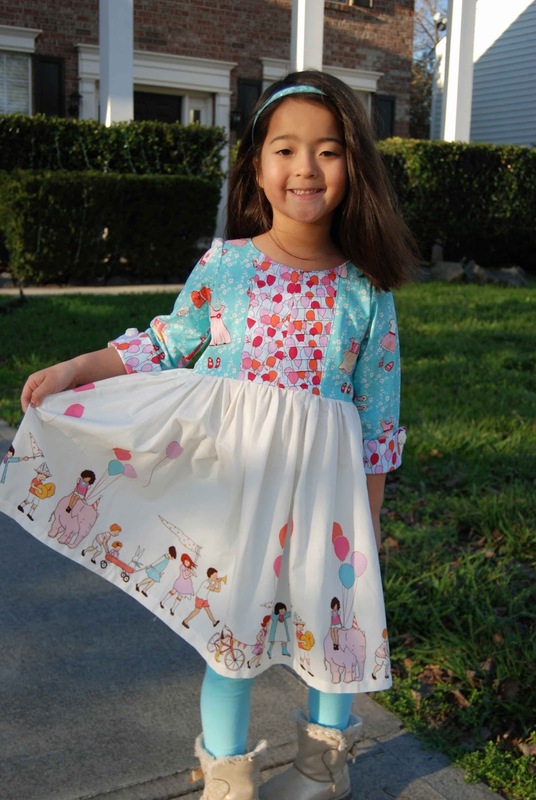 -The Little Lizard King Janie Lou Dress PDF sewing pattern includes a fabric chart, sizing chart and and cutting chart. -The Little Lizard King Janie Lou Dress PDF sewing pattern is a layered pattern (aka, just print the size that you need/want). 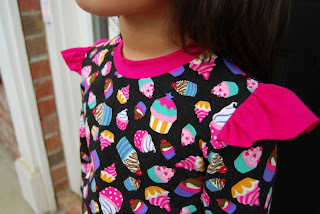 This is one of my FAVORITE features in a sewing pattern!! -The Little Lizard King Janie Lou Dress PDF sewing pattern features step-by-step photographs to help you sew through the pattern. -The Little Lizard King Janie Lou Dress has a top length and a dress length. -The Little Lizard King Janie Lou Dress includes measurements for a regular sash, or a jumbo sash. I sewed up a straight size six Little Lizard King Janie Lou Dress. I did the pintuck bodice inset, cuff sleeves no sashes. The fabric was bought online and is part of the Michael Miller "Children at Play" fabric line. 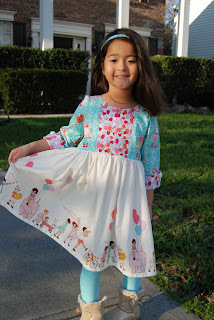 I've been hoarding, er, saving this beautiful fabric for a very special pattern... the Little Lizard King Janie Lou Dress is just PERFECT! 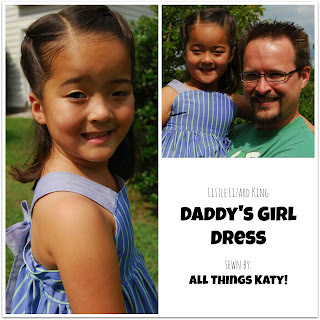 Let me start off by saying that the Little Lizard King Janie Lou Dress is definitely a labor of love. Those pintucks took me forever...! However, that gorgeous end result... LOVE IT!! 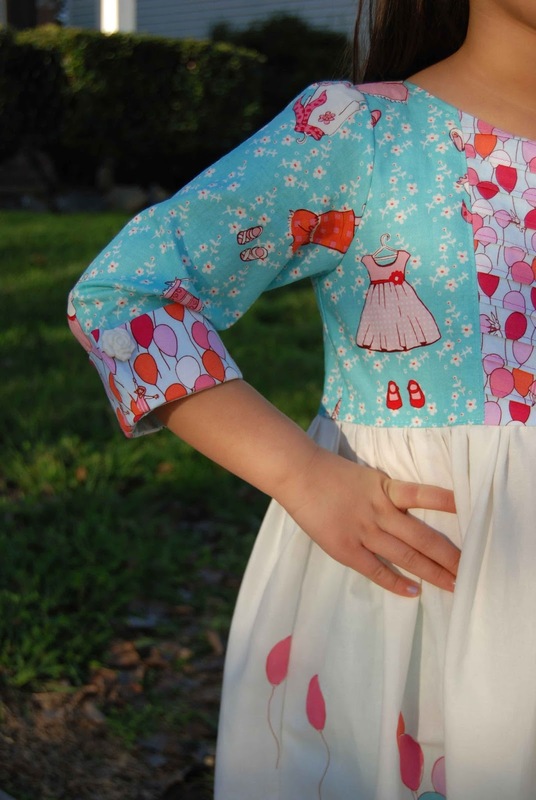 Another sweet detail of the Little Lizard King Janie Lou Dress is the cuff sleeve. 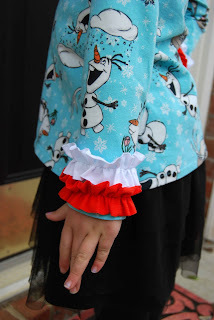 I've never sewn such a cuff, before, but I love the attention to detail and the touch of whimsy and sweetness that it adds to the overall dress. The button up back is also a nice (if somewhat tedious) touch to the dress. I really, really, REALLY wanted to do the jumbo sash (I'm such a sucker for big bows!) but I didn't want to hide the pretty dress design fabric. What can I say... I really do love you, Janie Lou!! Thank you Cassie and LLK team, for allowing me to test this gorgeous pattern! 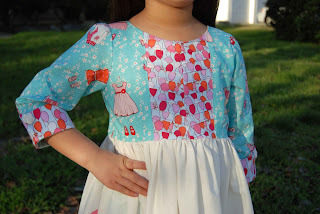 Good luck with the pattern release- this is my most favorite LLK pattern (yet)!!! Today, it is my pleasure to introduce you to the first Made for Mermaids pattern of 2016- the Mya Top, Tunic and Dress. Regular readers of All Things Katy! 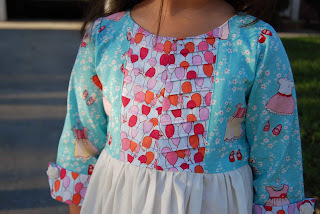 already know that Made for Mermaids is one of my FAVORITE PDF sewing pattern designers, and the Mya Top, Tunic and Dress does not disappoint. The Mya Top, Tunic and Dress is described as a simple a-line profile top, tunic or dress with multiple hem and sleeve options. -The Made for Mermaids Mya Top, Tunic and Dress is sized for 1/2-14y. 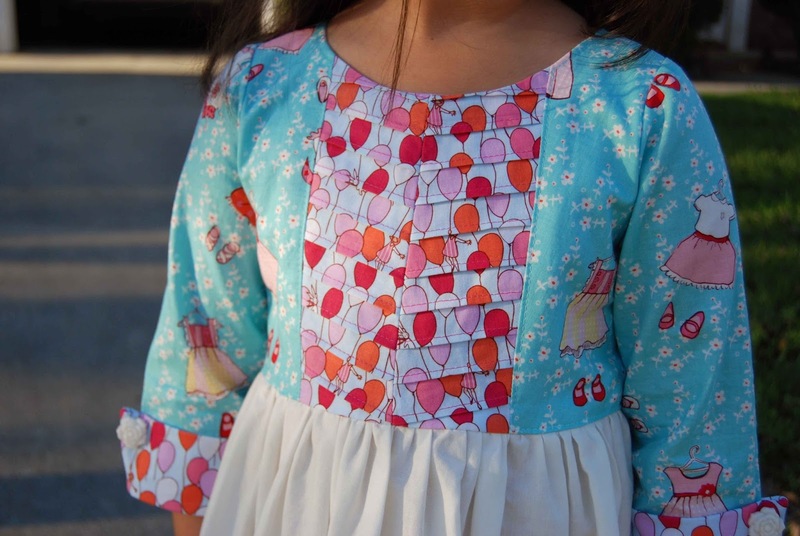 -The Made for Mermaids Mya Top, Tunic and Dress PDF sewing pattern tutorial includes a measurement chart, a cutting chart and fabric cutting chart. -The Made for Mermaids Mya Top, Tunic and Dress features three hemlines- top, tunic and dress. Only the tunic length is curved. -The Made for Mermaids Mya Top, Tunic and Dress features three sleeve lengths- short, 3/4 and long. 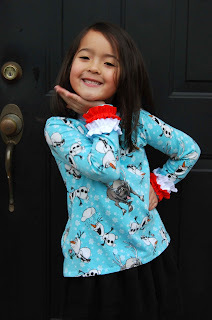 -The Made for Mermaids Mya Top, Tunic and Dress also includes pattern pieces/instructions for three different necklines- ruffle, banded and cowl. -The Made for Mermaids Mya Top, Tunic and Dress also includes pattern pieces/instructions for flutters (at the shoulder). 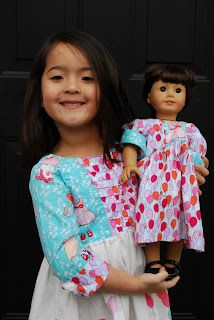 -The Made for Mermaids Mya Top, Tunic and Dress PDF sewing pattern tutorial includes numbered, step-by-step instructions and photographs for each step. 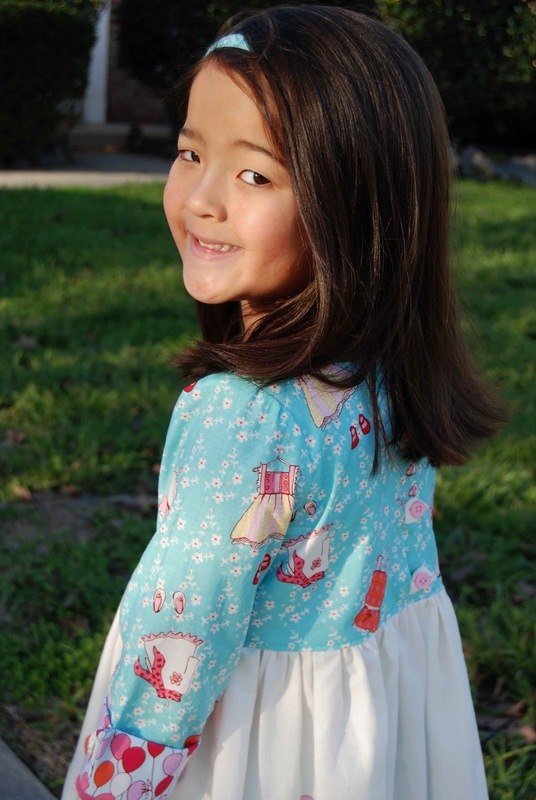 -The Made for Mermaids Mya Top, Tunic and Dress PDF sewing pattern includes trimless, layered pattern pieces (my favorite!). This means only cut the size that you need/want and no excess trimming before you put your pattern pieces together. Yay! I sewed up a size five width, size six length. We were instructed to sew up two garments in the course of testing. 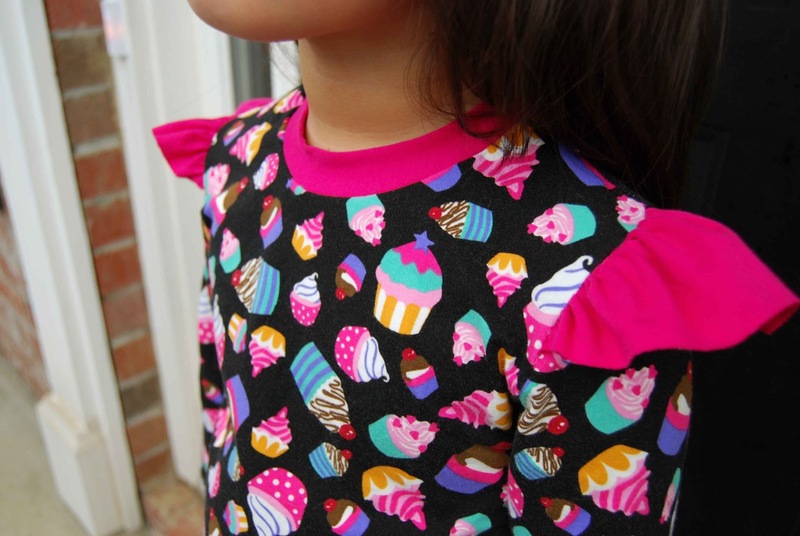 The black cupcake one is curved hemline, tunic length, flutter shoulders, 3/4 sleeve, banded neckline. 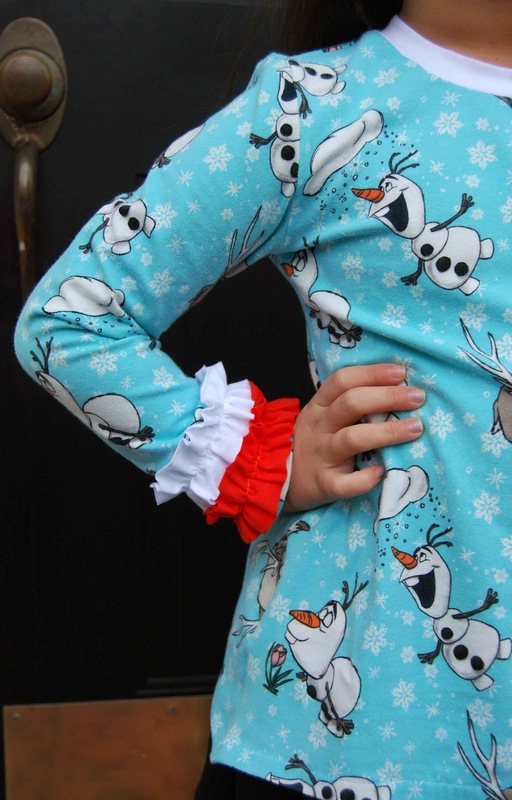 The Olaf and Sven one is top length, double ruffle sleeves and banded neckline. (I should note that my pictured tops are of the first go-around. The neckband was revised during the course of testing for better on/off). The Made for Mermaids Mya Top, Tunic and Dress is a super simple sew. It's a great wardrobe staple with a lot of options included in the pattern. That means you get a lot of bang for you PDF sewing pattern bucks! 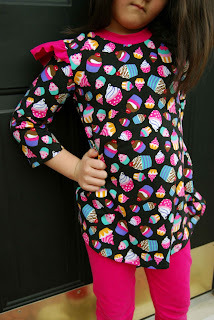 I sewed up the cupcake Mya Top, Tunic and Dress in about 20 mins.- no joke! It took me longer to print, assemble, tape and cut out the pattern pieces, than it did to sew up the actual top! I love a quick sew! Also, the Mya Top, Tunic and Dress isn't a fabric hog and the ruffles and flutters are a great way to use of those odd bits of knit scraps. 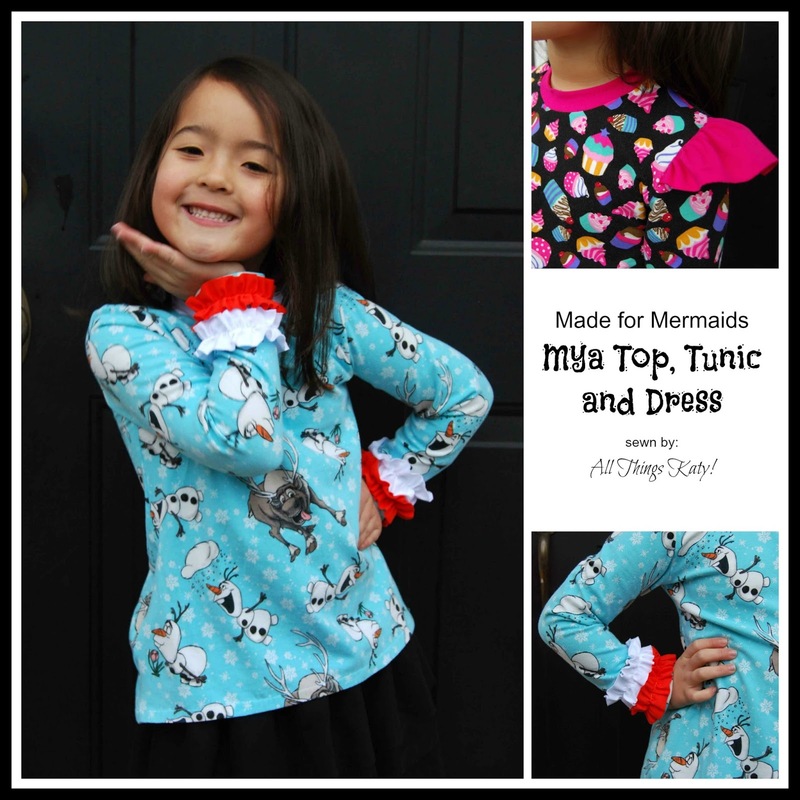 The Mya Top, Tunic and Dress looks great worn out, or layered under a cute jumper, or with a skirt (say, the Made for Mermaids Samantha skirt...? ;-). So, in conclusion, the Made for Mermaids Mya Top, Tunic and Dress is a simple, versatile, wardrobe staple pattern. 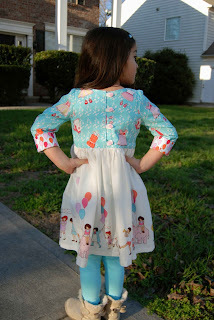 There are lots of variations and ways to make each garment you sew up, unique!! Thank you to the whole Made for Mermaids team for allowing me to test this wonderful pattern. Good luck with the pattern release!! Sew much fun! Katy and I got to spend a rare (now-a-days) Mommy and Katy day. Lil' Miss was off school for MLK day and I took off work to be with her. We lunched at Ikea (as per our usual ways ;-). Katy had eaten a good lunch and was onto eating her dessert. She offered me a bite. Not really much for the chocolate confection that she was offering, but grateful for her sincere and earnest intentions, I told that I'd, ".... take just a small little bite." "Technically, Mom, that would be considered a nibble. Something smaller than a bite is a nibble- not a bite," Katy corrected me. ...and there you have it folks.... I live with an walking talking dictionary..... ha! The other day, Lil' Miss was "helping" me get ready for work by handing me my makeup as I applied. Then, after I was all done, she declared that we should, "....snuggle cheek to cheek..." Thinking that she was being sweet and just wanted to cuddle, I put my cheek to her's. After a couple of seconds, she popped up and said, "Yay! Now I have makeup on, too!" (by transference). 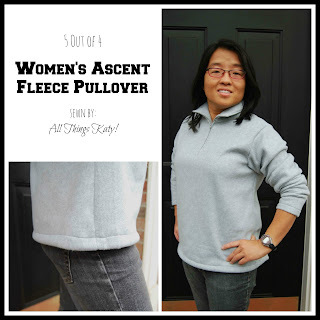 Back in November, I had the opportunity to test the new-to-me designer 5 out of 4 Women's Ascent Fleece Pullover. This pattern went through a couple of rounds of revisions but we finally got it just right...! Now, I had the opportunity to review the kidlet version of the same pullover, the 5 out of 4 Kids K2 Fleece Pullover. The 5 out of 4 Kids K2 Fleece Pullover is described as, "...a PDF sewing pattern for a relaxed fit kids’ 1/4 zip pullover with a relaxed shoulder. Optional invisible zipper pockets on side seam or front contrast. 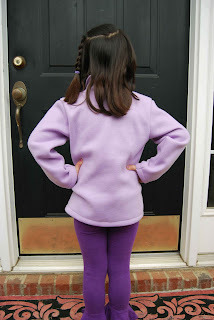 This pullover can be made color blocked or in a solid color." -The 5 out of 4 Kids K2 Fleece Pullover is sized for size 2-18. (honestly, I could probably fit into the 18!) That's a really great big, wide size range (lots of bang for your PDF sewing pattern buck ;-). 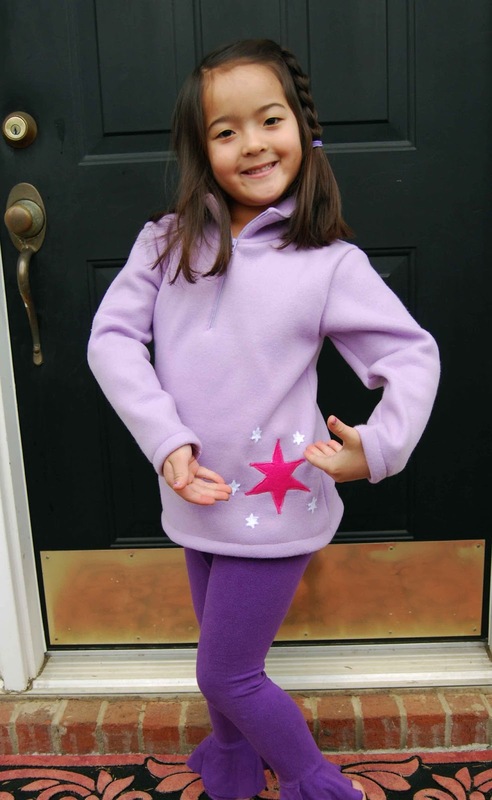 - The 5 out of 4 Kids K2 Fleece Pullover PDF sewing pattern includes a fabric requirement chart, a sizing chart, finished measurements chart and a helpful stretch guide. - The 5 out of 4 Kids K2 Fleece Pullover features layered, trimless pattern pieces (God bless layered, trimless pattern pieces!!). 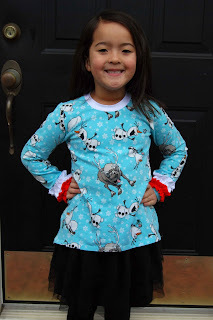 - The 5 out of 4 Kids K2 Fleece Pullover PDF sewing pattern also includes a printing guide (to tell you which pattern pieces/pages to print for your specific option). I love when patterns include this type of guide because it really saves paper- only print the pieces/pages that you need! Love that!! 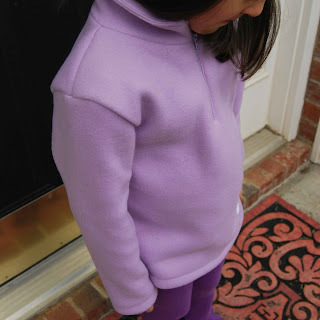 - The 5 out of 4 Kids K2 Fleece Pullover includes two options- solid or color blocked. Color blocked is great if you have limited fleece in one color, etc. -The 5 out of 4 Kids K2 Fleece Pullover features shaded diagrams for each step. There is a smattering of detail photographs included in the tutorial. -The 5 out of 4 Kids K2 Fleece Pullover also includes optional pocket pattern pieces. -The 5 out of 4 Kids K2 Fleece Pullover does require the advance knowledge of how to install a zipper (or more- depending on if you choose to do the zipper-closed pockets). 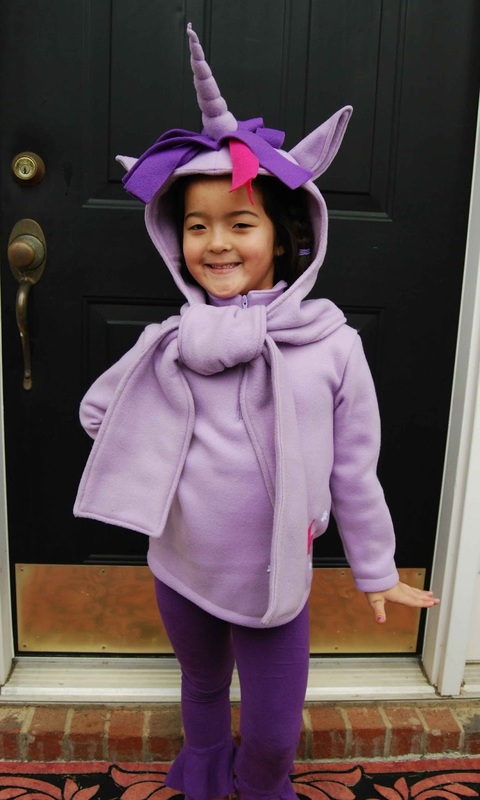 For Lil' Miss, I sewed up a size six, solid 5 out of 4 Kids K2 Fleece Pullover. I did not include pockets (much to Katy's dismay- she loves anything with pockets!!). I used anti-pill fleece leftover from my fabric stash (purchased locally from Hancock Fabrics). The instructions are fairly easy to follow. Right sides together, bodice, sleeves, hem. I did find the directions for the collar to be a big clunky and confusing (I found them to be confusing when I tested the women's pattern, though, too). So, I would definitely deem the 5 out of 4 Kids K2 Fleece Pullover an intermediate level pattern. Basic sewing knowledge will definitely come in handy when sewing up this pullover! The fit of the 5 out of 4 Kids K2 Fleece Pullover is pretty accurate. I found it to be roomy but not voluminous (aka, big enough to slip on over a top, but not so huge that Lil' Miss is swimming in it). I did make the sleeves 1" shorter (cut on the pattern provided shorten/lengthen line). 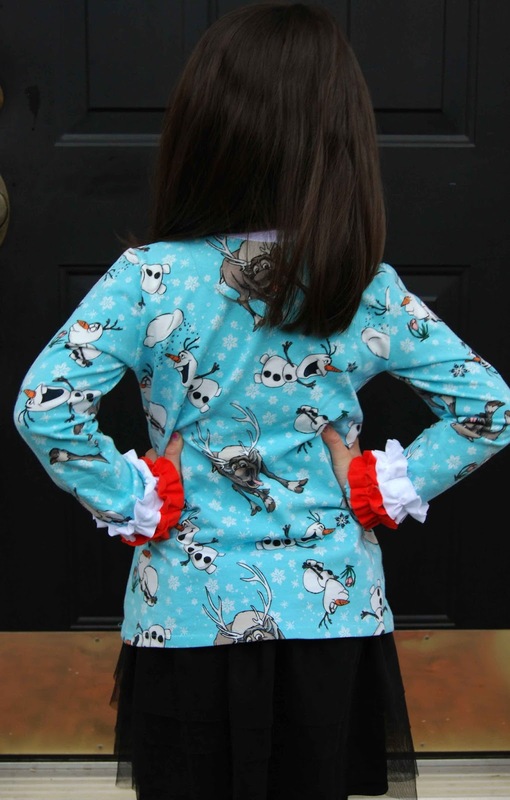 This shorter sleeve length was perfect for my daughter's wingspan. The 5 out of 4 Kids K2 Fleece Pullover hit right below the seat and the side seams hit directly where they should hit- on the sides. 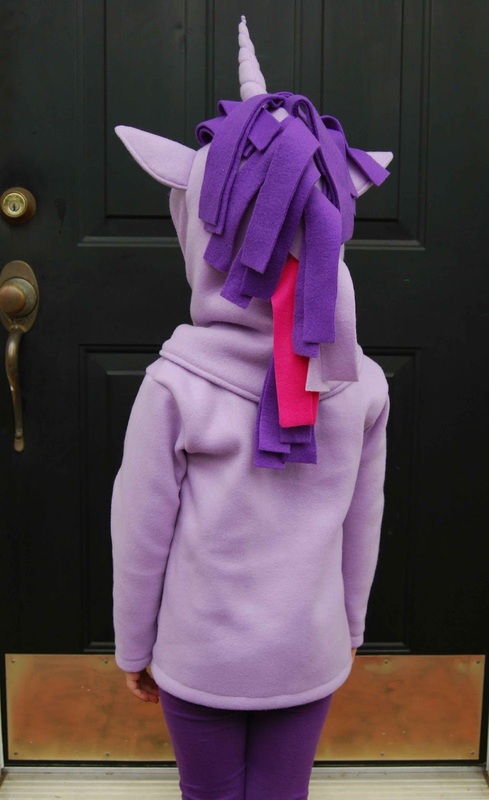 I did embellish my 5 out of 4 Kids K2 Fleece Pullover by doing a simple My Little Pony Twilight Sparkle cutie mark in the front, lower right hem. In conclusion, the 5 out of 4 Kids K2 Fleece Pullover is a great fall/winter staple for colder temperatures. Lil' Miss wears LOTS of pullovers in the transition months, so I love having a great wardrobe staple to include in my sewing repertoire! Now, go ahead and show the other participants in the 5 out of 4 Fleece Pullover Blog Tour some blog lovin' by checking out their 5 out of 4 Fleece Pullover Blog Tour posts! You can purchase your own copy of any of the 5 out of 4 patterns here for 30% using the code "fleeceforall" now through Jan 17th as they celebrate their 1 year anniversary! 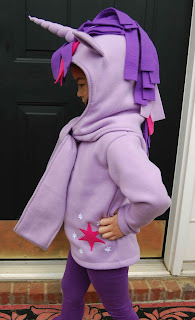 Now, my pony-loving girl just had to have a matching Twilight Sparkle hooded scarf to go with her MLP-inspired 5 out of 4 Kids K2 Fleece Pullover...! 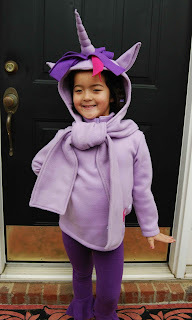 We had lots of fun trying on the 5 out of 4 Kids K2 Fleece Pullover with her Twilight Sparkle inspired hooded scarf (sewn using the Heidi and Finn All in One Hooded Scarf PDF sewing pattern). 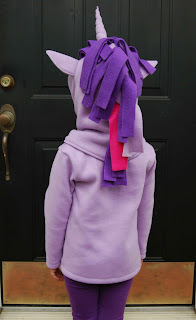 I loosely adapted the Sugar Tart Crafts My Little Pony Tutorial found here to do the mane and unicorn horn. Recently, I had the opportunity to sew up the Finn top by BLAVERRY. This new-to-me PDF sewing pattern designer was a pleasure to work with. Christie, the brains and talent behind the brand, definitely has a clear-cut vision for her BLAVERRY. Sleek, modern and fun are all adjectives that I would use to describe the BLAVERRY brand. 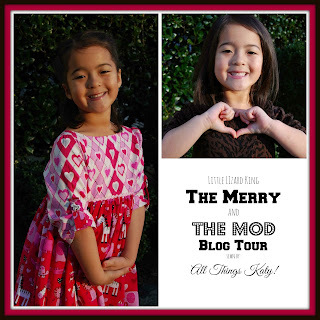 -The Finn top by BLAVERRY is sized for 2-16. -The Finn top by BLAVERRY has three sleeve lengths- cap, mid and long. 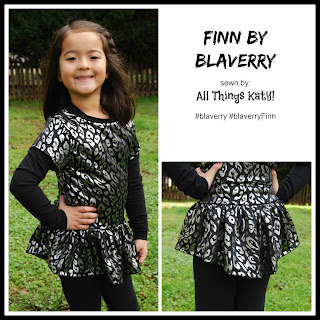 -Some reviewers of the Finn top by BLAVERRY lengthened the skirt ruffle in order to make the top a dress. 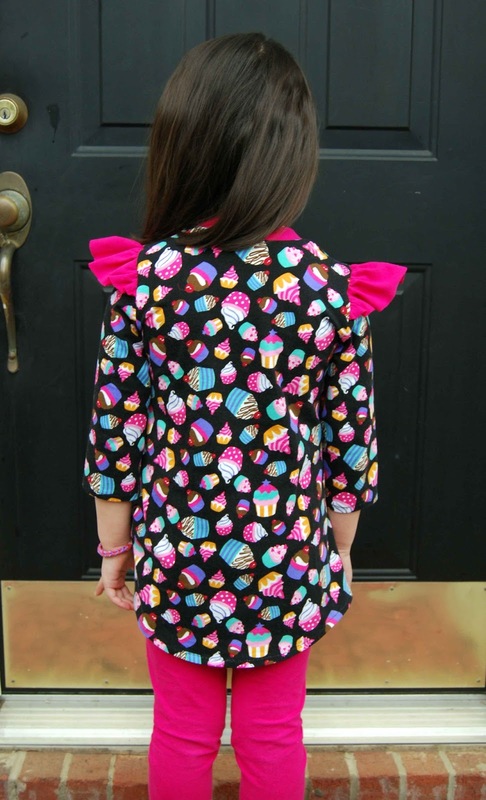 -The Finn top by BLAVERRY PDF sewing pattern includes nested, trimless, layered pattern pieces (love that!). 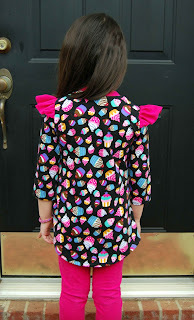 -The Finn top by BLAVERRY PDF sewing pattern tutorial includes shaded, step-by-step instructions. 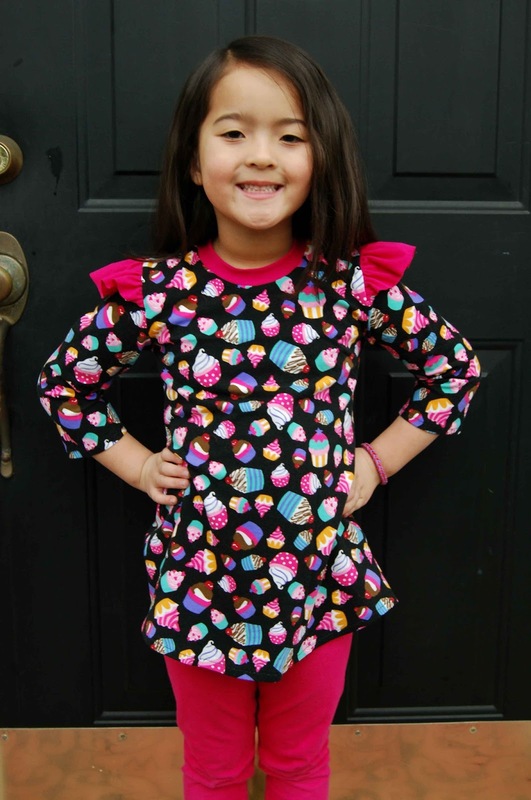 -The Finn top by BLAVERRY PDF sewing pattern includes a sizing chart, a fabric chart, and a hand fabric stretch guide. Measurements in the sizing and fabric chart are given in both imperial and metric. 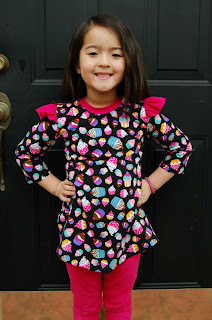 I sewed up a size six Finn top by BLAVERRY. Technically, Lil' Miss is a size five chest (and six height). However, due to the material that I was using for the body of the top, I knew that I'd need to have her layer the Finn top by BLAVERRY over another top. I wanted to make sure things weren't too constricting. 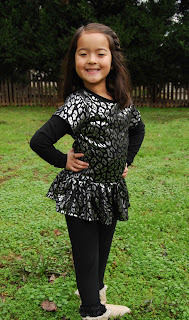 The silver metallic material was purchased locally at Hancock Fabric and the black cotton lycra neckband material was purchased online from Purpleseamstress Fabrics. The Finn top by BLAVERRY was a breeze to sew up. Actually, I got through sewing the Finn top by BLAVERRY so quickly that I almost thought I must have forgotten a step because I reached the end so soon. Trust me, that is a good problem to have! :-) Directions were clear and straight to the point- not second-guessing or wondering how to proceed. 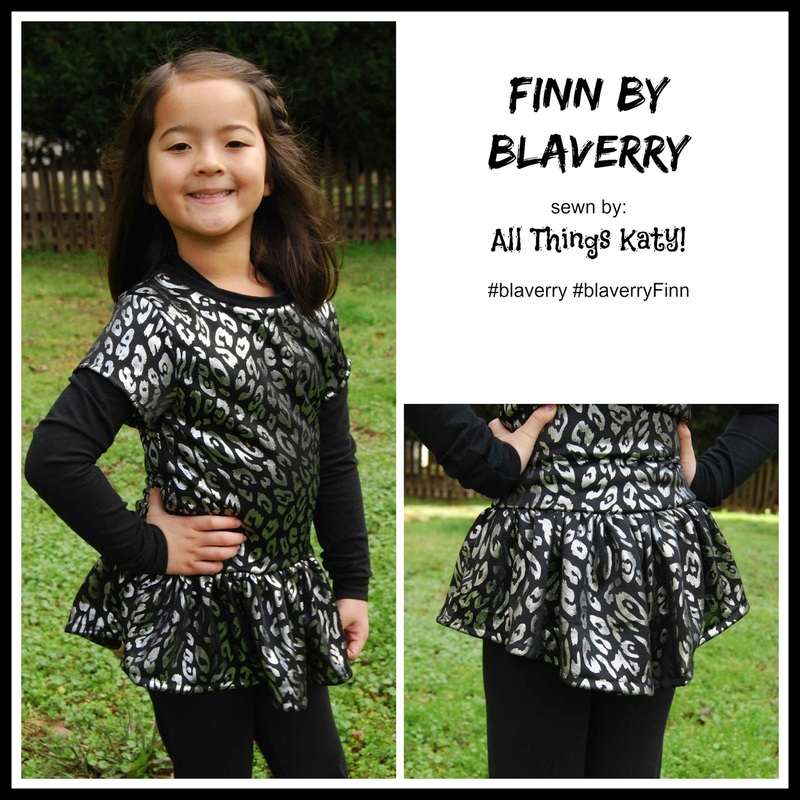 Also, when you get a chance to sew up the Finn top by BLAVERRY, be sure to tag it #blaverry and #blaverryFinn on all your social media! 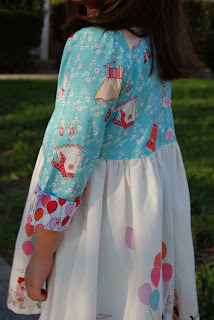 I'm guest blogging over at Little Lizard King Sewing Patterns blog. 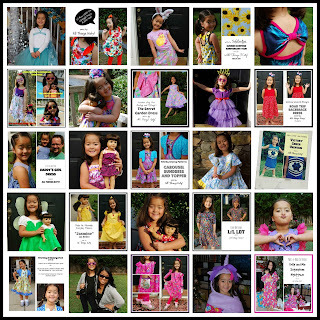 Come on over and check out their newly designed website and find out which Little Lizard King PDF sewing pattern was my #favoritesew of 2015. I sure did a lot of sewing in 2015...! Pictured, are just 25 of the clothes (only!) that I sewed for Lil' Miss, this year. 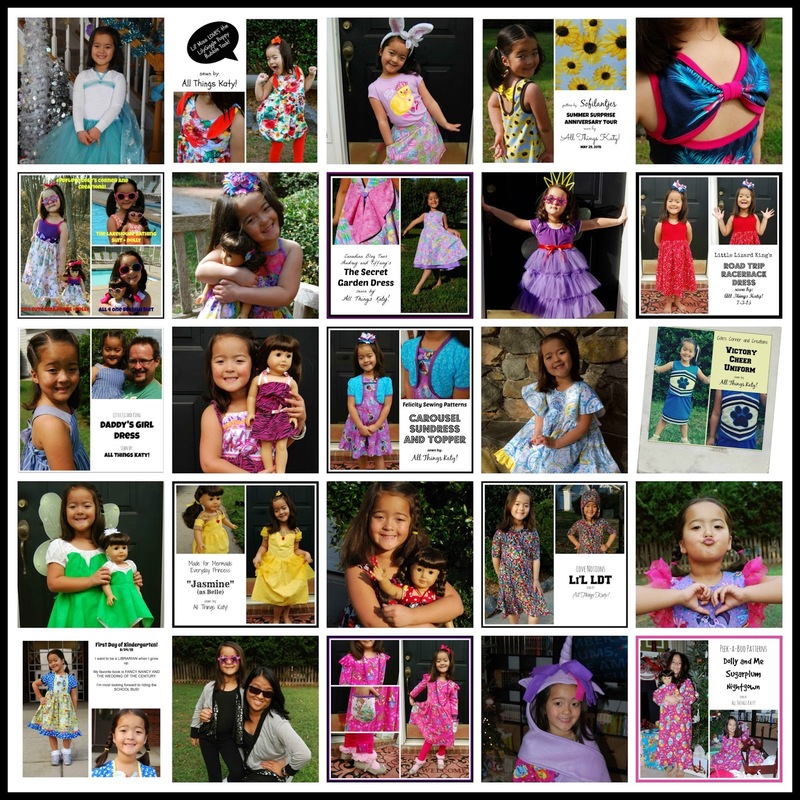 This does not include other dolly patterns that I tested and sewed, accessories, patterns I tested for myself and/or gifts that I sewed for others along the way...! Whew! Not only have I improved my sewing skills (tremendously!) since I first started out, but I've also made some really great friends and sew sisters along the way... Sewing has become a much-needed creative outlet for myself and I'm so grateful to learn something new with each pattern that I sew. :-) Sew Much Fun!